If a company does not have a mobile strategy in place or has not attempted enterprise mobile application development before, it is better for them to consider outsourcing. An app development agency carries with it the benefits of long experience, a proven methodology and necessary resources already in place. Creating an in-house team for enterprise mobile application development has long-term advantages. However, assembling such a team depends on budgetary allocations and developing a cutting-edge technology platform can be time-consuming depending on how available and affordable the right talent and technology will be. Organizations must decide between traditional waterfall and low-code methodologies of enterprise mobile application development. The traditional waterfall method tends to be more cumbersome and does not accommodate changes within a program after it has been finalized and deployed. It also involves an exceptionally large amount of manual coding which makes meeting tight deadlines nearly impossible. An exact opposite, the low-code methodology features reusable technology components, UI designs, connectors and business modules which allow code to be reused, thus saving time by up to 10 times, and costs for enterprises. 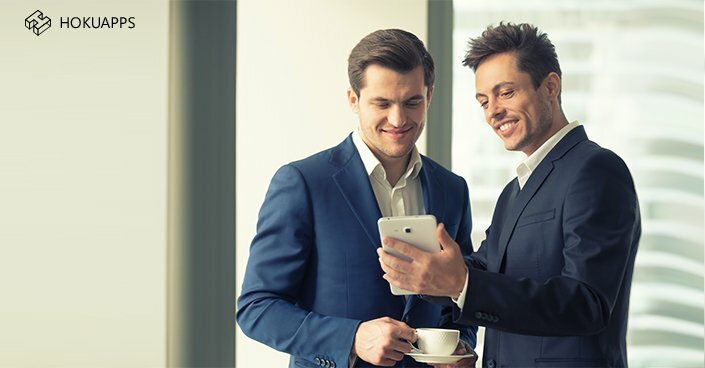 Additionally, the apps can be customized fully to suit the business’s unique structure and workflow. If creating enterprise-grade apps and saving time and costs is your aim, then the low-code methodology suits your purpose. A mobile strategy is not simply an extension of a company’s online presence. Ideally, it must function as a tool to complement both short and long-term commercial goals. To do so, enterprise mobile application development must begin with a clear understanding of an organization’s mission, its aims, it’s current standing in the market, its competitors, strengths, funding and recruitment capabilities. Also, mobile app developers need to comprehend what the organization intends to derive from the deployment of a mobile app. Before beginning the enterprise mobile application development process, organizations must define who will use the app. Identifying the user types is immensely helpful in developing relevant functionalities for the app. It must be understood that a mobile app is not simply a company website on a cell phone. It has to provide significant value to the customers so that they continue to use it. The app serves as a touchpoint for the user to interact with the company. Therefore, it is important that analysts fully understand the end-to-end process of engaging customers with the mobile app before embarking on the enterprise mobile application development process. To help businesses do this, the HokuApps platform integrates all apps with a granular reporting engine and dashboards that are fully-configurable. This way, businesses can not only understand changes in customer demand but also how the business is functioning. Most of the organization’s design apps are targeted towards iOS and Android. Building an app for iOS has multiple advantages. To cite one, Apple users are more likely to spend money on apps than Android users. Thus, the platform used for development is easy to follow, and apps can be finished in less time. iOS apps also need to be built for three versions and a finite number of screen sizes. 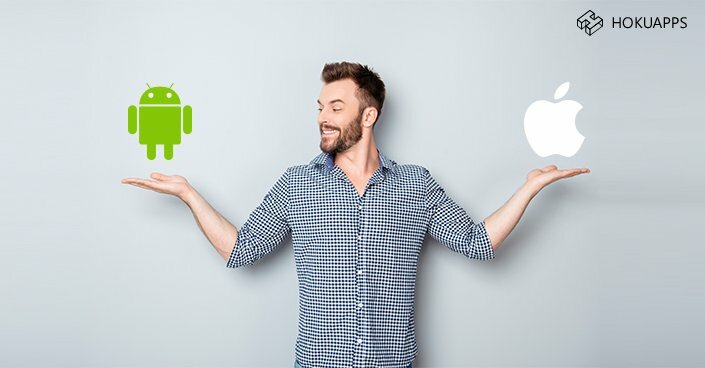 Android apps, however, have the potential to be used by a far larger number of users, as it is the dominant platform with most smartphone users from all across the globe. In addition, Google’s app release policy is much easier to adhere to than Apple’s far more stringent policy. HokuApps’ low-code app development platform automatically builds apps for iOS, Android and the Web so that businesses can get more for less. Before charting a blueprint or setting timelines for enterprise mobile application development, it is important to take a look at competitors and figure out what they are doing well, where they are faring poorly and what they are missing. This simplifies the process of incorporating best practices in enterprise mobile application development. It also helps to conceive ways to surpass the competition and establish a feature that becomes a radical differentiator for that particular app. The success of an app depends on its ability to provide functionalities that customers crave but cannot access due to lack of availability. For instance, Amazon was able to thrive by defining a clear initial mission of helping customers to find books online. It became an exclusive service that no other company was providing at the time. SWOT stands for Strengths, Weaknesses, Opportunities, and Threats – an analytical framework that can be implemented to identify company assets that can determine success, and what challenges organizations may confront in the long run. This relates to questions of infrastructure (both online and offline), business processes, funding, and staffing capabilities. The right mobile application development platform cannot be chosen without an intelligently enacted SWOT analysis. With the relevant information acquired, developers can, along with business leaders and stakeholders, decide upon a strategy in line with the company’s goals. This involves clearly defining the way in which the app would add value to users’ lives. For example, Headspace provides value by offering guided meditations on the go for quick grounding and alleviating mental stress. 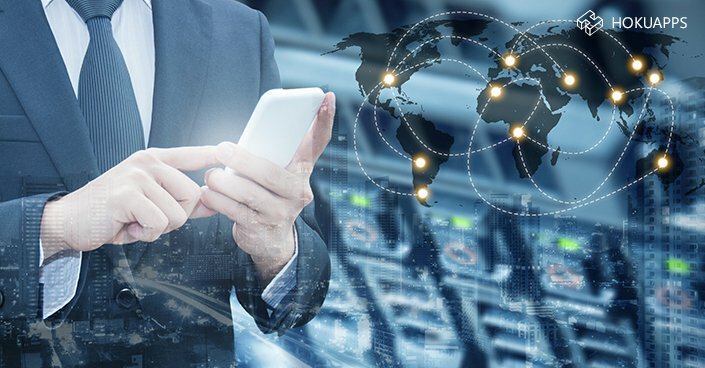 The development roadmap must be uniquely crafted to establish what teams will work on which aspects of enterprise mobile application development. In addition, the resources (financial, infrastructural and human) necessary to execute the strategy must also be understood and defined with perfect clarity. This is probably the most important factor to consider in enterprise mobile application development. The right platform can only be chosen after all the above issues have been carefully considered which helps enterprises to take the right decision. The platform must be responsive to both commercial/business and technological concerns and should be able to deliver the enterprise mobile apps within desired timelines. The testing strategy it uses is also a concern to be addressed by the decision-makers. It must also be appropriate for long-term enterprise mobile application development to justify the cost of purchase and usage. Choosing a mobile application development platform is no easy task, and must be done with a thorough understanding of a company’s overarching strategy, Key Performance Indicators (KPI) and target goals. This must be accomplished in collaboration with stakeholders and representatives from the operations, marketing, logistics, business development and account management teams. The issues outlined above represent what any company must decide upon before venturing into hands-on app development. Given that custom mobile applications have become the flagship for corporations to gain optimal performance, experimenting and leveraging new technologies on the right enterprise mobile app platform will yield positive business results for your enterprise.